All things considered, boys’ high school basketball is not a dangerous sport — relative to football, hockey, and wrestling, the risks of harm are not that high. Nevertheless, many athletes and coaches mistake the sport for a non-contact activity and do not properly prepare. When conducting practices and workouts, coaches must be mindful of both acute and overuse injuries. Basketball is a contact sport played at high speed. It has been estimated that male high school basketball players suffer an injury rate of 0.56 injuries per season. These injuries occur at a rate of 4.8 injuries per thousand athlete exposures. In games, intensity is higher and injuries occur at a rate of 16.9 injuries per thousand hours of game exposure (Caine, Maffulli, & Caine, Epidemiology of Injury in Child and Adolescent Sports: Injury Rates, Risk Factors, and Prevention, 2008, pp. 22-28). Despite a practice:game ratio of 3:1, 50.3% of injuries occur during games, likely due to an increase of intensity. Fortunately, half of the injuries require less than a week of recovery and thirty percent of injuries require one to three weeks of recovery. Professional players in the National Basketball Association suffer an injury rate of 19.3 per thousand hours of game exposure. The difference in injury rates is likely due to the dramatic increase in intensity at the professional level, where training and competition push the human body to its limits (Fleming, 2010). Many basketball movements use the lower body to generate explosive power. Cutting sharply, stopping and changing direction, and jumping and landing place athletes at a high risk of an acute injury. Two thirds of basketball injuries are to the lower body. Common injuries are: Knee (19.1% of all injuries, 13% of game injuries), Ankle (16.9% of all, 20.9% of game), Lower Back (9.0% of all, 7.2% of game), and Feet and Toes (7.9% of all, 5.0% of game) (Rechel, Yard, & Comstock, 2008, p. 200). Symptoms of an acute injury include sharp localized pain. The onset of the pain follows contact to the affected area or a sudden movement, like planting a foot while cutting or landing on a foot after a jump. Swelling, reduced movement, and lack of stability or weakness may also signal an acute injury (National Institute of Arthritis and Musculoskeletal and Skin Diseases, 2009). Many basketball players suffer strains, sprains, and tears of the Anterior Cruciate Ligament (A.C.L. ), especially female athletes. The A.C.L. is a stabilizer running behind the kneecap which connects the thigh bone to the shin bone. A blow to the side of the knee can injure the A.C.L. as can a non-contact injury like cutting or landing after a jump. When an athlete tears their A.C.L., a popping sound is followed by intense pain and swelling within six hours. In the case of a serious knee injury, do not attempt to move the joint. A splint should be used until evaluation by trained medical personnel has been performed. Do not return to play until proper evaluation and treatment has taken place (Sports Injury Clinic, n.d.). The treatment for an acute injury ranges from rest, ice, compression, and elevation to treatment from a sports therapist including surgery, immobilization, and physiotherapy. This article is not meant to provide medical advice. Consult a physician if a serious injury is suspected. In the case of young athletes, caution is recommended. Continuing to play can aggravate the injury or cause another injury because the distraction due to pain reduces athlete focus. Basketball players who train excessively are at-risk for overuse injuries to the lower extremities. Half of all youth injuries are overuse injuries, likely due to an organized training program that pushes a growing body past its limits (Hyman, 2009). Achilles Tendinitis is a strain of the Achilles tendon at the back of the foot if the calf muscle becomes tight while running or jumping. When basketball players devote more time to strength training, they may inadvertently shorten the gastrocnemius muscle and tighten the Achilles tendon, creating more plantar flexion and exposing the ankle joint to a greater risk of sprains (Leanderson, Wykman, & Eriksson, 1993, p. 205). Plantar Faciitis is strain of the ligament along the arch of the foot which can cause tenderness, swelling, or pain while running and jumping. The injury may require two to three weeks of rest. A lump on the arch of the foot may indicate a rupture of the ligament (Sports Injury Clinic, n.d.). Anterior Knee Pain is the most common knee overuse injury (Cumps, Verhagen, & Meeusen, 2007, p. 206). Chondromalacia Patellae occurs when knee cartilage rubs against the bone, and Patellar Tendinitis involves micro-tears to the tendon which joins the kneecap to the tibia (Sports Injury Clinic, n.d.). These conditions may lead to soreness during or after workouts. Athletes should wait for soreness to subside before commencing the next workout. The most common back injury for high school athletes during training is acute (short-term) back pain caused by a muscle strain (Rechel, Yard, & Comstock, 2008, p. 200). The injury may be caused back overtraining: lack of recovery between workouts, too much resistance, or too many repetitions. Strengthen the back, core, and pillar muscles with exercises such as plank variations and the superman stretch. Also, encourage players to keep their legs bent (instead of their backs) for better balance and posture. One Injury Leads to Another: Often, an instability or incorrect movement caused by one injury puts an athlete at risk for another. Derrick Rose was the reigning Most Valuable Player – someone who had only missed four games in his first three seasons – when the lockout-shortened 2011-12 season began. Playing sixty-six games in fewer than four months, compounded by occasional back-to-back-to-back games, caused multiple injuries. During the year, Rose injured his left ankle, left foot (turf toe), back, groin and right ankle before finally tearing his right Anterior Cruciate Ligament in the playoffs. Multiple lower body injuries may have altered his posture, causing a player who is normally very balanced to put too much weight on one side. Playing so many games may have curtailed Rose’s ability to train his core or maintain his flexibility. Rose missed a season before returning in 2013 and playing ten games. 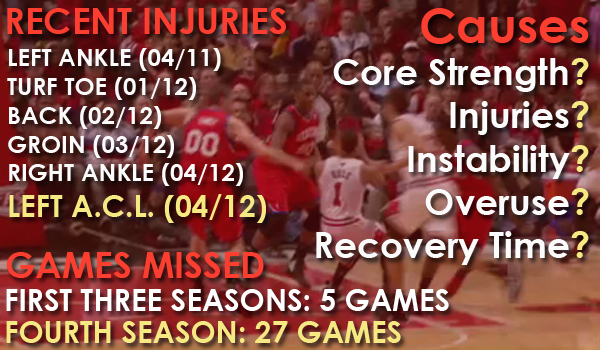 Before his comeback had truly taken off, Rose injured his right meniscus and missed the remainder of the season. Overuse will be a concern for the remainder of his career and he will have to limit his minutes and games played in the future. Minor soreness after a workout can be treated with rest, ice, and gentle massage or stretching. Young athletes should not persevere during a sprain (stretching a tendon or muscle beyond its limits) or strain (minor muscular tear). The difference between soreness and a serious injury is that soreness is dull pain over a larger area whereas a strain is sharp pain localized to one area (Sports Injury Clinic, n.d.). The continuous pounding of running or the high impact of jumping and landing can cause stress fractures, such as the second metatarsal bone in the big toe, the navicular bone, or the heel. Symptoms are tenderness and swelling at the point of the injury and pain that worsens during the activity. Athletes should see a doctor if a stress fracture is suspected and may need to immobilize the foot for six to eight weeks (Sports Injury Clinic, n.d.). During and immediately following a growth spurt, young athletes are at additional risk for an acute injury. When limbs and muscles grow in size, they place additional stress on tendons which can be slower to develop. Boys may suffer from reduced flexibility in their joints (Hawkins & Metheny, 2001, pp. 1703-1704). Inadequate treatment and rehabilitation in youth sport lead to re-injury and overuse injuries. Coaching staff must monitor closely and employ good judgment when the player is too young to do so for themselves (Caine, Caine, & Maffulli, Incidence and Distribution of Pediatric Sport-Related Injuries, 2006, p. 509). Lack of physical fitness is a major risk factor for injury (Hergenroeder, 1998, p. 1059). Teams that are not in peak condition may be unable to handle the intensity and volume of the training. As athletes tire during practice or competition, the risk of injury increases. Muscles and tendons are pushed beyond their limits, contributing to overuse injuries, and mental focus wanes. Stress from outside the sport also contributes to this fatigue (Kerr & Minden, 1988, p. 171). Traumatic brain injuries playing basketball have risen seventy percent in the last ten years for youth playing basketball. This is partially due to greater understanding of concussions and their long-term effects but it is also due to athletes who are bigger faster and stronger (Hutchison, 2010). Most concussions are caused by collisions – with another athlete, the floor, or the ball. After a suspected concussion (symptoms include confusion, vomiting, or change in consciousness), the athlete should be removed from play and given a concussion test. The player should see a physician. It is important to give youth plenty of time to recover from their injury before they return to play; someone who comes back too soon is at a greater risk of a traumatic brain injury which may compound the severity of the symptoms. In additional to the intense nature of the sport and overtraining, there is a multitude of mental factors that amplifies the risks facing athletes. Excessive pressure to perform in sport may contribute to both physical and mental harm (Hergenroeder, 1998, p. 1063). Athletes experiencing high A-Trait anxiety lose focus and awareness of the game situation. Even minor irritations, such as the daily hassles which accumulate from time to time can increase the risk of injury. Players who experienced a high degree of aggravation faced a greater risk of acute injury during the following week (Williams & Andersen, 1998, p. 10). If an athlete is worried about something not directly related to the task at hand, they are not focused. Basketball is a dynamic game that requires players to remain aware of the ball and nine other players. Poor perception may cause players to enter risky situations where acute injuries are more likely, for example by missing vital visual or auditory clues (such as another player diving for the same loose ball), instigating contact, or pushing themselves beyond their abilities (Andersen & Williams, 1988, p. 299). A-State anxiety raises muscle tension, one of the top factors for lower extremity injuries in basketball (Williams & Andersen, 1998, p. 17). This tension disrupts co-ordination and flexibility, leading to sprains, strains, and other injuries (Andersen & Williams, 1988, p. 299). Hormones such as Adrenaline, which is released to cope with stressful situations, may interfere with attentional focus or raise aggression to the point of generating a dangerous situation (Sports Injury Bulletin, n.d.). Previous injury may cause an athlete to doubt themselves and consequently hesitate or favour a specific body part. This may lead to lack of focus or incorrect technique. Also, muscle or tendon which has already been hurt may have a lower tolerance for training, which makes it more susceptible to an overuse injury (Caine, Maffulli, & Caine, Epidemiology of Injury in Child and Adolescent Sports: Injury Rates, Risk Factors, and Prevention, 2008, p. 32). A single ankle sprain can reduce confidence, increase postural sway, and elevate the risk of future injury (Leanderson, Wykman, & Eriksson, 1993, p. 204). Athletes should maintain a positive frame of mind. Some players may feel that they are a failure should they fail on the court. Worry about disappointing themselves, friends, coaches, or family members can heighten anxiety. Participants in youth sports should pursue mastery-oriented goals and strive to meet their needs for socialization and fun. Youth who remain fixated on performance-oriented goals could push themselves too far, aggravating minor injuries or soreness (Hergenroeder, 1998, p. 1062). Players with low self-confidence in their abilities are about four times more likely to be injured than those who are more confident. This low perception leads to a self-fulfilling prophecy as a fear of injury and failure results in a loss of focus and a real injury (Kontos, 2004, p. 453). The answer is not false praise but objective communication between players and coaches about what is possible at that moment. Positive team environments provide all players with social support which can boost confidence and relieve anxiety (Johnson, Ekengren, & Andersen, 2005, p. 33). Simple education in proper technique, hydration and nutrition, training strategies, and common injuries can make a difference in the number of sports injuries suffered by adolescents (Caine, Maffulli, & Caine, Epidemiology of Injury in Child and Adolescent Sports: Injury Rates, Risk Factors, and Prevention, 2008, p. 45). Sports injuries peak in adolescence because of increased risky behaviour. Young males may inaccurately perceive the risk of injury inherent in a situation and attempt an ill-advised action (Kontos, 2004, p. 453). Most concussions are the result of collisions, which can be minimized if the player is cognizant of their surroundings (Hutchison, 2010). Coaches must inform athletes about the real risk of their sport. Honest and thoughtful self-evaluation of one’s body while exercising minimizes overuse injuries (Johnson, Ekengren, & Andersen, 2005, p. 33). When young athletes are fixated upon a sport, they may not make sound judgments about their physical and mental health. It’s particularly necessary for parents and guardians to understand the risks of athletics so they can model sound judgments (Hyman, 2009). Injury rates are correlated to the level of play. As skill increases, so does the risk of injury (Hergenroeder, 1998, p. 1059). In practice, athletes may attempt skills that are beyond their abilities. In games, players work even harder to keep up with expert opponents. As the level of competition rises, knowledgeable coaching in practices and workouts is imperative. Balance, strength, and agility are required to perform advanced basketball skills. A player who is balanced is not only more effective but more stable. This stability distributes stress evenly throughout the lower extremities while running and jumping. Balance training is very effective in reducing the risk of ankle sprains among youth basketball players (Cumps, Verhagen, & Meeusen, 2007, p. 212). A proper warm up routine including cardiovascular work, ankle strengthening and dynamic stretching, and speed work prepares athletes for training. Dynamic stretching is favoured over the static variety, which decreases performance in activities requiring strength, speed, and power. Pre-activity static stretching may stiffen muscles and tendons, raising the risk of injury (Kovacs, 2006, pp. 6-7). A cool down routine can dissipate lactic acid and adrenaline in the body, reduce muscle soreness after practice or the next day, and quicken recovery for the next workout. Flexibility training – during cool-down routines and at home – will improve balance and reduce injuries (Leanderson, Wykman, & Eriksson, 1993, p. 205). “Pre-hab” exercises strengthen a body part before it is injured. Before or after practices, a player can perform minor exercises to stretch the ankle joint, such as balancing, small hops, lifts, and pivots. Teams can include a specific ankle warm up (with or without shoes) and players could even work on their ankles at home while watching television. Strengthening the hamstrings and quadriceps will reduce the risk of A.C.L. injuries. A few repetitions each practice can make a big difference without consuming too much time. Athletes who have sustained an injury should be mindful to follow the instructions of their doctor or therapist. Incomplete Rehab: When an athlete does not entirely rehab their injury before returning to action, they can be susceptible to further injury. Elite trainer Tim Grover will not clear professional basketball players until they can complete a depth-jump from a forty-eight inch plyo box back up to another box of similar size. He feels that athletes who have suffered lower body injuries will hold back, perhaps risking further injury to their ankles, knees and hips until they are mentally ready (Grover, 2013, p. 217). Greivis Vasquez required ankle surgery while he was playing with the New Orleans Pelicans in the 2012-13 season and returned before the injury had fully healed. Toronto’s Director of Sports Science believed that the incomplete rehabilitation was hindering Vasquez’s performance on the court and that he needed to address that issue first in order to increase the guard’s effectiveness on the court (McKechnie, 2014). With the Raptors, Vasquez substantially increased his three-point range and defensive efficiency, contributed to a playoff run and decided to resign with the team in the off-season. Sport-specific agility and plyometric drills instruct athletes in the correct technique and build capacity. Training routines initiated during the pre-season phase of the Yearly Planning Instrument and continued during the competitive phase reduce acute injuries significantly (Caine, Maffulli, & Caine, Epidemiology of Injury in Child and Adolescent Sports: Injury Rates, Risk Factors, and Prevention, 2008, pp. 34-35). During this training, coaches and adults should supervise and moderate, not enable and encourage young athletes to push themselves too far. Individuals with a history of personal stress and possessing few coping skills will experience more injuries. Practice should not only include physical training but mental preparation as well. When practice mimics the pressure of game situations, players are constantly putting their skill, athleticism, and coping skills to the test (Sports Injury Bulletin, n.d.). Participants in a stress management program experienced half of the injuries as a control group without any specific training (Williams & Andersen, 1998, p. 20). These techniques may include pre-game visualization, positive self-talk, and breathing exercises. Prior to participating in competitive sport, athletes should enter an Ideal Performance State. The words and actions of coaches strongly influence young athletes. If a coach seems out of control, team members could adopt this personality and play carelessly (Sports Injury Bulletin, n.d.). Coaches and adults should behave consistently, reacting calmly to both success and failure. A coach who bring the stress from their other life into practice or reacts to a bad break during a game like it’s the end of the world models a poor example. Throughout the season, teams should follow an organized training program. Coaches should increase capacity gradually and provide suitable rest periods. Soreness may occur, especially early in the training program. Wait for soreness from a prior workout to diminish before training again. If soreness occurs frequently, decrease the intensity of the workout. Daily contact with players permits coaches to assess the team’s stress level throughout the season and monitor the risk of injury. When a coach senses that a team is tired, they can shorten the workout to prevent an overuse injury. Taper periods reduce physical demands of players at key times during the year when mental pressures are greatest. Despite the best precautions, injuries are inevitable. By utilizing safe facilities and equipment, certifying themselves in First Aid and sport-specific training, and closely supervising athletes, coaches can minimize the frequency and severity of injuries. A coach’s initial reaction to an injury – providing appropriate care and encouragement – is critical for the athlete’s recovery. Andersen, M. B., & Williams, J. M. (1988). A Model for Stress and Athletic Injury: Prediction and Prevention. Journal of Sport and Exercise Pscyhology , 10 (3), 294-306. Caine, D., Caine, C., & Maffulli, N. (2006). Incidence and Distribution of Pediatric Sport-Related Injuries. Clinical Journal of Sport Medicine , 16 (6), 500-513. Caine, D., Maffulli, N., & Caine, C. (2008). Epidemiology of Injury in Child and Adolescent Sports: Injury Rates, Risk Factors, and Prevention. Clinics in Sports Medicine , 27 (1), 19-50. Cumps, E., Verhagen, E., & Meeusen, R. (2007). Efficacy of a sports specific balance training programme on the incidence of ankle sprains in basketball. Journal of Sports Science and Medecine , 6 (2), 212-219. Fleming, J. (2010, December 16). Injuries Costing Teams Big Bucks. Retrieved February 13, 2011, from Hoops World: http://www.hoopsworld.com/Story.asp?story_id=18214. Grover, T. (2013). Relentless. New York City: Scribner. Hawkins, D., & Metheny, J. (2001). Overuse injuries in youth sports: Biomechanical Considerations. Medicine & Science in Sports & Exercise , 33 (10), 1701-1707. Hergenroeder, A. C. (1998). Prevention of Sports Injuries. Pediatrics , 101 (6), 1057-1063. Hutchison, C. (2010, September 13). Basketball and Concussions. Retrieved April 23, 2011, from ABC News: http://abcnews.go.com/Health/WellnessNews/basketball-concussions-head-injuries-rise-teen-sports/story?id=11603847. Hyman, M. (2009, April 9). America’s Obsession with Youth Sports and How It Harms Our Kids. Retrieved April 18, 2011, from Sports Illustrated: http://sportsillustrated.cnn.com/2009/more/04/06/youthsports.untilithurts/index.html. Johnson, U., Ekengren, J., & Andersen, M. B. (2005). Injury prevention in Sweden: Helping soccer players at risk. Journal of Sport and Exercise Psychology , 27 (1), 32-38. Kerr, G., Minden, H. (1988). Psychological Factors Related to the Occurance of Athletic Injuries. Journal of Sport & Exercise Psychology , 10 (2), 167-173. Kontos, A. P. (2004). Perceived Risk, Risk Taking, and Injury Among Adolescent Sport Participants. Journal of Pediatric Psychology , 29 (6), 447-455. Kovacs, M. S. (2006). The Argument Against Static Stretching before Sport and Physical Activity. Athletic Therapy Today , 11 (3), 6-8. Leanderson, J., Wykman, A., & Eriksson, E. (1993). Ankle sprain and postural sway in basketball players. Knee Surgery, Sports Traumatology, Arthroscopy , 1 (3-4), 203-205. McKechnie, A. (2014, September). Sports Science and the Toronto Raptors. Speech presented at the Gatorade Sports Science Conference, Mississauga, Ontario. National Institute of Arthritis and Musculoskeletal and Skin Diseases. (2009, June). What Are Sports Injuries? Retrieved April 23, 2011, from National Institutes of Health: http://www.niams.nih.gov/Health_Info/Sports_Injuries/sports_Injuries_ff.pdf. Rechel, J. A., Yard, E. E., & Comstock, R. D. (2008). An Epidemiologic Comparison of High School Sports Injuries Sustained in Practice and Competition. Journal of Athletic Training , 43 (2), 197-204. Sports Injury Bulletin. (n.d.). How much do psychological factors such as stress and personality contribute to the risk sports injuries? Retrieved April 18, 2011, from Sports Injury Bulletin: http://www.sportsinjurybulletin.com/archive/stress-sports-injuries.html. Sports Injury Clinic. (n.d.). Injury List. Retrieved April 4, 2009, from Sports Injury Clinic: http://www.sportsinjuryclinic.net/cybertherapist/injurylist.htm. Williams, J. M., & Andersen, M. B. (1998). Psychosocial antecedents of sport injury: review and critique of the stress and injury model. Journal of Applied Sport Psychology , 10 (1), 5-25.